Boundaries. Dividing frontiers between the sacredly private and the tolerantly exteriorised, honoured by some and profaned by others. The limits are subjectively thin. 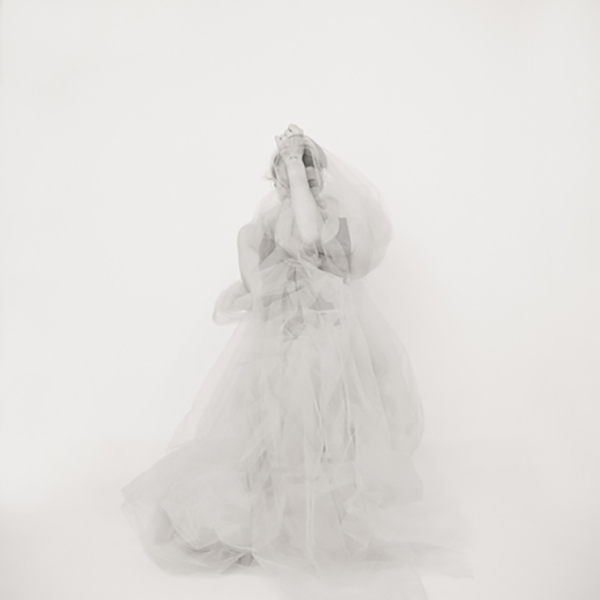 As thin as the enveloping tulle that conceals Tanya Traboulsi in Untitled 6 of her photographic series under the title You. An auto portrait of the Austrian-Lebanese artist, the monochromatic work presents a pale figure whose ghostly contours dissolve in a white background, mimicking the blurriness between inquisitive freedom and distanced respect. Sitting down on a precarious-looking wooden chair, Traboulsi adopts a defensive body language, shielding her head with one of her arms and fearfully shutting her eyes. The insightful posture, seemingly orchestrated to prevent theft of thoughts by undesired rubbernecks, is accentuated by the myriad layers of textile reinforcing the artist’s shield. It covers the artist’s lower part of the body entirely, conferring it the appearance of a levitating celestial corpse. Ruminations on a meditative equilibrium emerge, on the importance of distance and the acceptance thereof — theoretical principles that are materialised by the haziness of Traboulsi’s work upon close inspection. When a step back is taken, the clouds suddenly dissipate, allowing the viewer to fully grasp the intricate details of her delicate character.